I hope these public figures don’t use that information as password or answer to security question in their private life. With personal data being readily available, these high-profile targets surely must have already been victim (although maybe not be aware of it) of password-guessing and social engineering attacks? …because nobody cared to target them? …because this particular knowledge does not pose a threat? …because their personal subscriptions/service-usage is unknown? E.g. you don’t know they use Gmail, which bank, insurance, webshops. …because their personal logins/names are unknown? …because this personal info was not used as password or answer to a security question? …because this personal info is, by itself, insufficient to compromise accounts? In a sense, our representatives function as guinea pigs for testing assumptions about the risk associated with disclosing personal data — or rather, at least with disclosing this particular personal data. Disclosing SSN, bank account numbers, credit card numbers and DigiD credentials probably remains a bad idea. The median anonymity set size was 2, meaning that half of the combinations of town + date of birth + gender in our data set either unambiguously identified an individual (Dutch citizen), or a group of only 2 individuals. The numbers vary depending on town size, but for ~37% of Dutch citizens in our set that QID is identifying up to a group of 5 or less individuals. As you see on the above list, the disclosed personal information possibly includes quasi-identifier value + real identity for the representatives. Just thought this is worth mentioning. Since the data is publicly available anyway: here is the list of all representatives and their quasi-identifier value. I used Firebug and manual code inspection to puzzle out which Dutch govt websites have which (ad)trackers like Google Analytics and Nedstat comScore (who bought Nedstat in Q3/2010). Some reflection is desirable, IMHO, on whether or not to disclose which (Dutch) IP address accessed what (Dutch govt) content to foreign-owned companies who’s government may require/force them to hand it over. Note: I only looked at the homepage of each site. WebTrends. Own server: wt.tweedekamer.nl (62.58.80.119); no other traffic observed. Some custom internal page visit counter? I don’t know what data is collected / is not collected by the various trackers, and lack the time to carry out that analysis. If you feel like it, please do so; I will be more than happy to link to your results or post them on this blog on your behalf. Easter Egg on Dutch Govt Recruitment Website. Intended or Not? UPDATE 2013-12-24: today, Queen Elizabeth II pardoned Alan Turing and remitted Turing’s sentence! See the document here (.pdf). UPDATE 2013-07-20: UK government has signaled its intent to support a bill that would issue a posthumous pardon to Alan Turing. UPDATE 2012-01-03: this challenge is still up. Happy Alan Turing Year! the embarrassingly late apology, in 2009, by the British government for inhumane way Turing was treated by them for being gay. As a small kick-off, I have a EUR 100 code-breaking challenge for you! In the above photo, I hid the IMEI of the iPhone used to take the photo using Niels Provos‘ outguess-0.2, which dates back to 2001. Stegdetect and stegbreak provide a starting point, but a simple stegbreak alanturing+imei.jpg won’t provide the answer… I will pay EUR 100 to the first successful code-breaker, provided you allow me to post your method on this blog. You get full credits (as well as EUR 100). Send your answer to mrkoot at gmail dot com, or leave a comment on this blog. 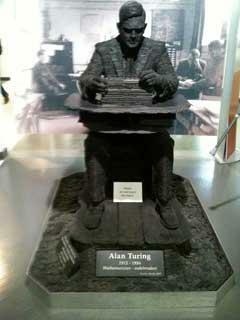 Consider celebrating 2012 as the “Year of Alan Turing”, e.g. by supporting the ongoing efforts by United Kingdom Mathematics Trust http://www.turingcentenary.eu/, already backed by ACM, Wolfram and others.